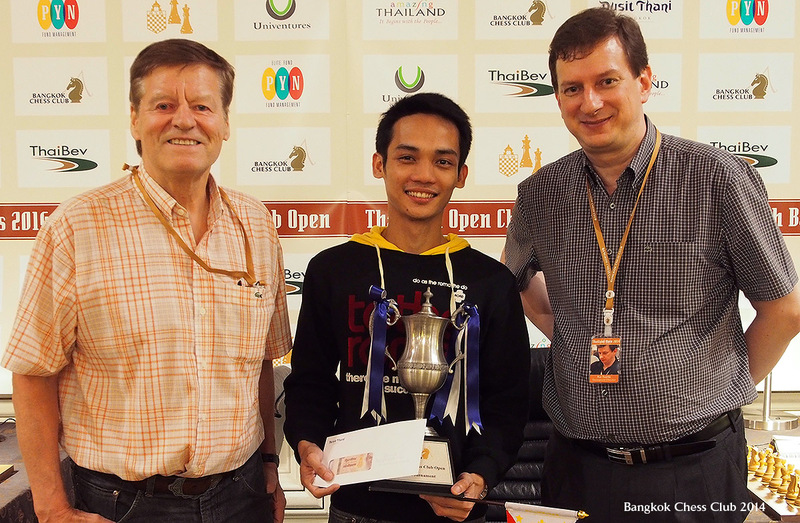 Shortly after the tournament I sat down with runner-up GM Oliver Barbosa from the Philippines to talk about his great performance and his impressions of the tournament, coming 2nd Place in the main draw and BCC Open Blitz Champion for the second year running. 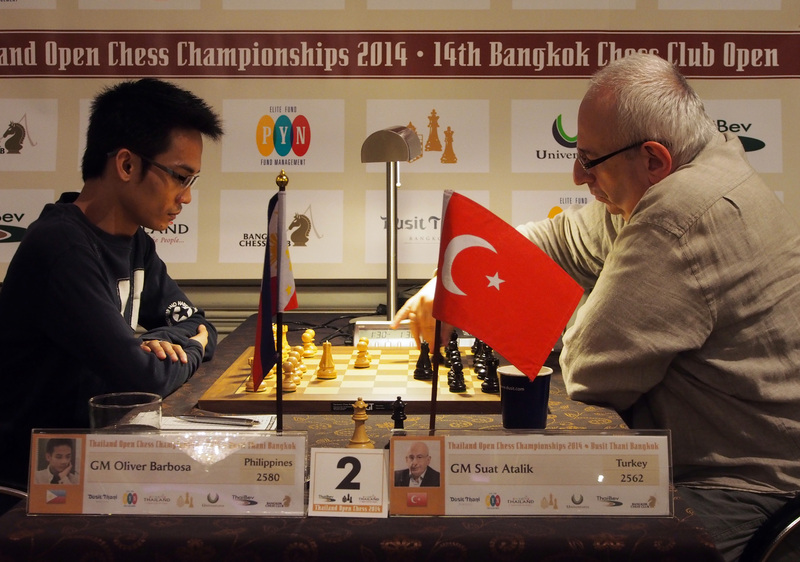 And here is a key game from the eighth round between GM Barbosa and GM Atalik. Their epic battle was captivating for the viewers and certainly nerve-wrecking for the players. 1. d4Nf6 2. c4e6 3. Nf3c5 4. d5d6 5. Nc3 exd5 6. cxd5 g6 7. Bf4 Bg7 8. Qa4 Bd7 9. Qb3 b5 10. Bxd6 c4 11. Qa3 Qb6 12. Bc5 Qb7 13. Bd4 b4 14. Ne4 bxa3 15. Nd6 Kf8 16. Nxb7 axb2 17. Bxb2 Nxd5 18. Ne5 c3 19. Ba3 Kg8 20. O-O-O Nb6 21. Nxd7 N8xd7 22. e3 Ne5 23. Rd4 h5 24. h3 Nc6 25. Re4 a5 26. Bc5 Rb8 27. Ba6 Nb4 28. Rxb4 axb4 29. Bxb6 g5 30. Bd4 Bxd4 31. exd4 Rh6 32. Nc5 Rd8 33. Rd1 Rhd6 34. Be2 Rxd4 35. Nb3 Rxd1 36. Bxd1 Ra8 37. Kb1 Re8 38. Kc2 Re1 39. Nc1 Rg1 40. Bf3 g4 41. hxg4 hxg4 42. Bc6 Re1 43. Bd7 g3 44. fxg3 Re3 45. Bc6 Rxg3 46. Bf3 Rg6 47. Nd3 Rb6 48. g4 Ra6 49. Bd5 Rg6 50. Nxb4 Rxg4 51. Kxc3 Rg3 52. Nd3 Kf8 53. a4 Ke7 54. a5 Kd6 55. Bxf7 Kc6 56. Bc4 Rg5 57. Kb4 Rh5 58. Nf4 Rg5 59. Nd5 Rg1 60. Nc3 Rg4 61. Na4 Kb7 62. Kb5 Rg5 63. Nc5 Ka7 64. Bd3 Rh5 65. Kc6 Rh1 66. Ne4 Rd1 67. Bc4 Ra1 68. Kb5 Rb1 69. Kc5 Ra1 70. Kb4Rb1 71. Bb3Ka6 72. Nc5Ka7 73. Ne6Ka6 74. Nd4Rb2 75. Ka4 Rb1 76. Bc4 Ka7 77. Nc6 Kb7 78. Nb4 Ra1 79. Kb5 Rb1 Since his 54th move, white has made some progress, but it is hard to see how he can queen his pawn on a5 any time soon. Atalik’s rook keeps pestering him very effectively. We’re in the fifth hour of the game and both players have little time on the clock. White now attacks the rooks with 80. Bd3, after which black could continue his resistance with 80… Rb3. However, he responded with 80… Rb2?? In this position white has a decisive blow. How did GM Barbosa finish the game? Find the solution after the interview. AKJ: Congratulations for your impressive achievement. You are the runner-up with the same number of points as the winner GM Vallejo Pons. How do you feel now that the tournament is over? How do you see your performance? OB: I feel very relieved that this tournament is over because my last four or five games were very long and hard-fought. I was quite tired during these games. I’m happy with the way I played here. I only lost one game against GM Schebler, but I won against compatriots Laylo and Torre, two strong grandmasters from the Philippines. 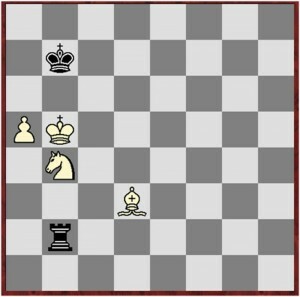 In the penultimate round I won against GM Atalik, which was not a clear win for me until the end. Luckily I won that game. Today in the last game against Vallejo Pons I just tried to equalize. Luckily I managed to do that, and when he offered a draw I readily accepted it. I didn’t play against the second and third seed, maybe that’s why I managed to become co-champion. AJK: What went wrong in your game against GM Schebler? OB: I didn’t think that black would be better after some exchanges in the middle game. I thought it was just going to be equal and black has a slight push, but after the exchanges it became very hard for me. That’s when I thought I shouldn’t have exchanged some pieces and noticed I’m in trouble. AJK: What was your most interesting game? OB: Maybe the one against GM Atalik in the penultimate round. I’ve checked the game and the engine says it’s equal until the end. I thought the position could be won because I had two pieces and a pawn for his rook. I wasn’t quite sure how to win this, but luckily in the end he made a mistake. It was a very tiring 5-hour game. AJK: What do you think about the Dusit Thani Hotel, the organization of the tournament, and the overall strength of the competition? OB: I want to congratulate the organizers for putting together this tournament. I think it’s well organized, and thanks also to the Dusit Thani Hotel for this beautiful venue. There was one minor problem because the lighting was a bit dim, but it was fine with the additional lamps next to the boards. This is a strong tournament with 13 grandmasters and also strong international masters like Liu Quingnan who is over 2500 and a World Cup qualifier. There are three or four 2600s, and Vallejo Pons came down from 2700, so he plays at that level. AJK: You’ve played in Bangkok this year and last year in Pattaya. Do you have any preference? OB: I prefer to play near the beach because it’s pretty relaxing. You can walk in the afternoon or evening and get some fresh air. AJK: What are your professional plans for the rest of the year? OB: This year we have the national championship in July, which also counts as the elimination for our Olympiad team. I need to reach a top-four spot in order to qualify for the team. Then, I would like to play the Annual Washington International in August but am not sure yet whether I can actually go to the US. And for next year I’m planning to start a chess school in Manila so that I can share my talent with kids. AJK: Do you intend to come back to Thailand next year. OB: Definitely. As I’ve already said, it’s a well-organized tournament and an excellent venue. AJK: Thank you so much for your time and best of luck. Soon to come: An interview with third-placed GM Jan Gustafsson.